The kids are almost back in school after the winter break…..time to get back to routine and prepping lunches for myself. I found this salad on Pinterest which brought me to the website aheadofthyme.com. I changed this recipe slightly. I pre-cook a bunch of Quinoa to use during the week, so I just took out a measured cup of Quinoa to make this salad. I find this easier than making a cup every time. The best part about online recipes is the user feedback. I highly suggest that if you come across a great recipe…make sure to take a look at what people said about it. In this Quinoa salad recipe, lots of people swapped out the raisins. I did too. I added red onion. Other highly suggested options where pine nuts and feta. Someone also swapped out the spinach with kale with great results. Make this salad your own! However, do not change the dressing! It is wonderful on this salad. I made the dressing and used it all on one cup of Quinoa with all my veggies and it was perfect. If you double this recipe, make sure you double the dressing too. 2. In a medium saucepan, boil 2 cups of salted water. Add the Quinoa and continue to boil for about 10 minutes until the Quinoa is tender. 3. Drain the Quinoa and let it cool. 4. In a large bowl, combine the spinach, tomatoes, cucumbers, raisins and cooled Quinoa. 5. In a small bowl, make the lemon vinaigrette. Combine the lemon juice, olive oil, salt and pepper. Pour onto the salad and toss to coat. 6. Season to taste with more salt and pepper, if needed. I love this salad. I can not wait to make it for lunch using fresh picked blueberries at the cottage. This recipe is from http://www.ifoodreal.com. I could not find fresh basil, so I did not add it. I missed it, but the salad is still good without. 1. 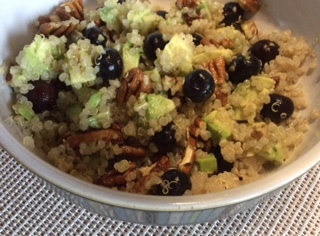 In a large bowl, add quinoa, blueberries and avocados. 2. In a small skillet, toast pecans on low-medium heat until lightly brown, about 5 minutes. Stir frequently and watch closely not to burn. Transfer to a bowl with other ingredients. 3. In a small bowl, whisk together Lime Basil Dressing ingredients, pour over the salad and gently stir to combine. Serve cold.